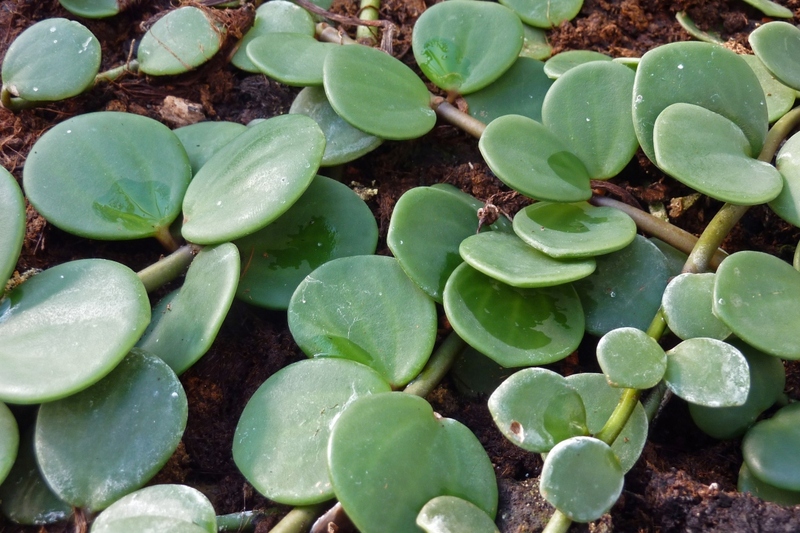 Round leaf Peperomia (Peperomia rotundifolia): growing, planting, caring. A species with small rounded leaves - suprised? A species with lengthy soft stems that may intertwine and weave in and out of each other, producing many small rounded leaves, thick and soft. The peperomia is a perennial with evergreen fleshy leaves, alternate or verticillate, elliptical or cordiform, on long petioles. The flowers are for the most part discrete and white with erect ears. You can plant your peperomia plant, in pots, in bottles or other small containers, in a fibrous mix of compost or heathsoil and potting soil. The principle is that the mixture must be draining and rather neutral or acid, because the plant mainly takes water by its leaves. Peperomia does not like excess moisture, water once a week in season, but spray foliage often with non-calcareous water. In summer, add liquid fertilizer for green plants every 2 weeks. Stop all fertilizer treatments at the end of summer. Every 3 or 4 years, at the end of winter, transplant your peperomia carefully to a slightly larger pot than it's current, adding a mixture of heather earth, topsoil and garden soil. Red spiders enjoy the dryness of the air. Increase the humidity if you notice a transparency of the leaves. On the other hand, if you notice leaf swelling, the ambient humidity is too high, reduce the intakes - do the same in case of roots rotting. Vigilant deadheading once or twice a week will prolong the blooming period !